When most dog owners think of muzzles, they tend to get a little bit uncomfortable. We’ve grown to think of muzzles as torture devices, or as warnings that a dog is violent. Even those who see the necessity of muzzles in certain situations feel like they are punishing their dog if they use one. The facts about muzzles are buried under this perception, and today on the blog, we’re going to lay some of that to rest. The truth is that a muzzle is just a tool, just like any other tool. In fact, when used correctly – and I do want to emphasize that they should be used correctly – muzzles are no more or less cruel than a leash. When you see a dog wearing a muzzle who is otherwise well-behaved, it doesn’t mean that they are a vicious dog. It could mean that the owner knows that they are going into an unfamiliar situation, and is trying to be proactive about everyone’s safety. It could mean that the dog and the owner are working on a new training command. It could even mean that the event you are attending requires muzzles on all dogs regardless of temperament. Whatever the reason, don’t automatically assume that a muzzled dog is dangerous. The first type is a slip muzzle. This is made out of fabric or mesh and has an opening at the end where the dog’s nose pokes through. Think of these as a tube that slips over the dog’s mouth, and has a neck strap keeping them in place. You may see these at a veterinary clinic because they are cheaper and come in a variety of standard sizes. You don’t necessarily have to have the exact size on these muzzles because the fabric will give just a little bit. muzzles made out of tougher material, such as leather, or you can find adjustable slip muzzles that are more like loops that keep a dog’s mouth closed. Many of the cute, gimmicky muzzles that are out there are technically slip muzzles since they have an opening at the end, such as this duckbill muzzle. These muzzles are typically the more humane choice if your dog needs to be muzzled for a longer time period. So now that you know what types of muzzles exist, and why you might choose one or the other, let’s talk about why you might choose to use a muzzle at all. When used correctly, these should not harm a dog. The biggest issue with a muzzle is using it for too long. 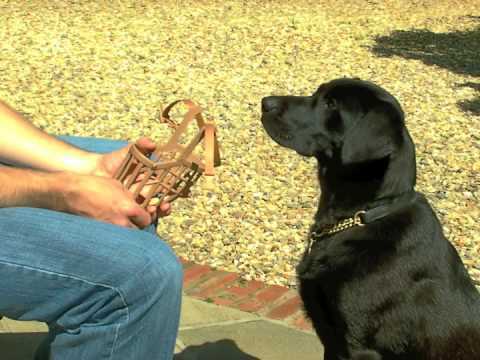 A slip muzzle should not be used for more than 15 or so minutes; a basket muzzle should only be used for around an hour, max. If your dog must be muzzled for longer than this, it’s a good idea to take him somewhere private and give him a break periodically. If your dog is friendly and well-trained but has not been around a lot of children before, you may want to muzzle them if introducing to a child. If your dog has a history of reacting unpredictably in new situations, you may want to train them to wear a muzzle at the beginning of new situations, till you can judge how they are feeling. If your dog tends to be shy and needs space to get used to people before warming up, you may want to use a muzzle as a visual signal to people to give your dog space when out in a crowded area. As you can see, most of the reasons to use a muzzle are for the dog’s comfort and everyone’s safety. Nowhere on the list do you see anything about punishing a dog. Second, behavioral issues are not solved by stopping the action itself, but by figuring out the underlying reason and either solving it or training your dog out of the behavior in a positive way. For example, excessive chewing could be the sign of boredom. Give your dog a fun toy instead, or start exercising him more often, to relieve the boredom, and you’ll usually find that the chewing will calm down. Sometimes after a dog has reacted to a situation poorly, such as biting or snapping at another dog or a person, they will have a muzzle put on them temporarily. You need to know that this is not a punishment for the behavior itself, but rather a way to calm the situation down and keep everyone safe until the situation can be de-escalated. It’s never a good idea to punish a dog with a muzzle because that will only make him fearful. It’s better to solve the problem that caused the bad reaction in the first place.